Quick and easy way to set up Apache Web Server. Is there a better alternative to Mapache? Is Mapache really the best app in Internet Utilities category? Will Mapache work good on macOS 10.13.4? 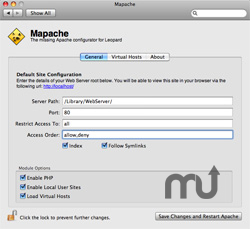 Mapache is a utility for Web Developers that develop on a Mac and need a quick and easy way to set up the built-in Apache Web Server. Voilá... the missing Apache Preference Pane for Leopard! Mapache supports editing of the main Apache host, including path, port, access restriction, access order and a few options. Mapache also makes it easy to enable Leopard's built-in PHP module and also Virtual Hosts -- both are switched off by default. A second pane makes it easy to add/delete or edit as many Virtual Hosts as you like along with various options. Mapache needs a rating. Be the first to rate this app and get the discussion started!